Op de website RootsAction is een actie gestart om de Qataarse overheid op te roepen dichter Mohamed Ibn Al Ajami, die inmiddels een jaar vast zit voor het voordragen van een gedicht over de opstanden in Tunesië, vrij te laten. We, the undersigned, including poets, men and women writing, performing and reciting poetry in all corners of the world, urge the Secretary of State or Foreign Minister of our respective countries to appeal to the Qatari Court for the immediate release of our colleague, Qatari poet Mohamed Ibn Al Ajami, who after spending a year in solitary confinement, on November 29, 2012 was sentenced to life in prison by the Qatari courts. Mohamed Ibn Al Ajami’s crime consisted of reciting on November 16, 2011 a poem extolling the courage and values of the popular uprisings in Tunisia, /Oh revolutionary, sing the praises of the struggle with the blood of the people/ in the soul of the free carve the values of revolt/ and to those holding the shroud of the dead tell/ that every victory also bears its ordeals/. 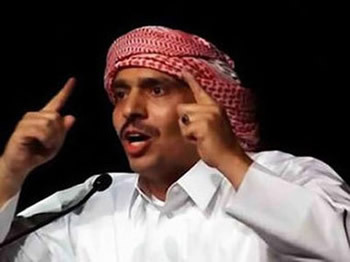 Rather than making itself an instrument for cracking down on dissent, we believe that the Court should uphold Mohamed Ibn Al Ajami’s right to free speech. In the tradition of speaking truth to power, following the footsteps of such great poets as Pablo Neruda, Majakovski, Nazim Hikmet, Mahmoud Darwish, Faraj Bayraqdar and innumerable others throughout the world today, such as Colombia’s poet Angye Gaona, Mohamed Ibn Al Ajami placed his poetic talent to the service of a movement for change. The poem he recited called for an end to intolerable conditions, a demand that for the past two years has been aired by millions throughout North Africa and the Arab world. In this spirit, we poets and non-poets who perceive the need for worldwide change at the social, political and ecological level, call on the Court to review the appeal, stop siding with repression and lend its ear to the movements that have sprung up all over the world for dignity, social justice and freedom, virtues that poets all over the world are endeavoring to voice and deliver using the beauty and power of poetry. kreeg hij een straf van liefst vijftien jaar!